Yuan Shikai became president, manipulated a rubberstamp assembly into giving him full powers, and then declared himself emperor. It didn't work out. Mao: Stalin's first major error was one as a result of which the Chinese Communist Party was left with one-tenth of the territory that it had. His second error was that, when China was ripe for revolution, he advised us not to rise in revolution and said that if we started a war with Jiang Jieshi that might threaten the entire nation with destruction. Khrushchev: Wrong. A nation cannot be destroyed. Mao: But that is how Stalin's cable read. Yuan Shikai, called out of retirement to lead the Beiyang Army against the forces of the Revolutionaries in 1911, turned on the Emperor and used his clout as a military leader to declare an end to the Manchu Empire of the Qing. He went on to use his influence to secure his appointment to the Presidency of the Republic of China. Yuan was, though more popular than the Manchu, still not a particularly popular leader as he conceded most of the '21 Demands' made by Imperial Japan upon threat of war (which asked for economic concessions in North China/Manchuria) and later tried to declare himself Emperor. Both moves were to be expected - in Chinese history, those who overthrew the previous dynasty often started their own. However, most of the country's middle classes wanted a Republic, and a democratic one at that. Yuan was forced to resign as Emperor in 1916, and died soon after. His rule undid many of the successes of the 1911 Revolution, most notably all hope of a central and stable government, let alone a democratic one. Under his rule the different regions of China slowly drifted apart, and upon his death the country fragmented. When Yuan died, the central government broke down entirely. Yuan's 'military governors', recognised as such for their power-bases in their locales, went their own way and effectively carved out their own states. Some Warlords, like Zhang Zuolin of Manchuria (a godawful governor himself, but he had some very able administrators whom he largely left alone and trusted to run things for him as long as they gave him enough money for his armies) were effective rulers, but most... not so much. Warlord rule was characterized by extremely high and largely arbitrary taxes (some collected years in advance), arbitrary conscription into their personal armies and a lack of economic development in those areas governed by the worst warlords. Many Warlords would even force their peasants to produce opium (and heroin) to support them and their drug monopolies. It's important to note, though, that warlords' attitudes and temperaments varied wildly. Feng Yuxiang (warlord of Anhui province and the lower Yangzi) acquired the moniker 'The Backstabbing General' from his own troops and was a devout Christian who took to baptising his soldiers before battles (reputedly with a firehose). Zhang Zongchang (warlord of Shandong province) was dubbed by Time magazine 'China's basest warlord' and was known throughout China as 'The Three Don't Knows' because he reputedly had no idea how much money,note He had several prominent merchants shot for "refusing" to control the inflation he was causing by printing money to pay his troops how many concubines,note He gave them numbers, because he couldn't remember their names or even speak their languages (which included Japanese, French, and Russian) or how many soldiersnote 'Somewhere in the vicinity of 40-50 000' he had. It's worth noting that although overall growth was veeeery slow because most regions attracted little foreign investment from those not keen to invest in intermittent-warzones, domestic investment prevented stagnation and several more stable and relatively-unmolested areas, like Manchuria (and the lower Yangzi, to a lesser extent), prospered and experienced growth and development which brought them on-par with parts of south-eastern Europe, India, or Latin America. The net effect was a Chinese economy which grew at roughly the same rate it had done in the last few decades of the Empire of the Qing's existence. One could say that this was development despite the country's somewhat-unstable political situation, and certainly not because of it. Sun Yat-sen (also known as Sun Yixian among other names, based on the current Pinyin scheme of transcribing the Chinese language into the Latin alphabet) failed (1911-)revolutionary and 'Father of the (Chinese) Nation', set up the Chinese Guomindang (GMD for Guomindang or KMT for Kuomintang) or National(ist) Party in Guangzhou in 1919. The old 'Guomindang' still existed, but the Warlords had made it irrelevant in most of China. This new KMT was more of a coalition, with various wings possessing different ideas on how a Chinese republic should be run. Political leanings ranged from liberal to staunchly conservative, while other wings focused on styles of government, ranging from authoritarian to democratic. As Sun and Chiang took advice from all the different wings at certain points, the KMT was effectively centrist as a political party for many decades. Sun Yat-sen had been elected President of the Republic in 1917, but the post had become meaningless by that point. The Kuomintang accepted foreign aid, mostly from the USSR in the form of advisers like Borodin, at whose insistence socialists were also allowed into the KMT. In 1923, Chiang Kai-shek, by now, brother-in-law of Sun and likely successor (also known as Jiang Jieshi) became the director of Whampoa Military Academy, the core of Sun's vision for a China unified by force. Sun died in 1925. Incidentally, after the end of World War I, the KMT became very close to the Weimar Republic, who became a key source of both military and industrial support for its forces (known as NRA or National Revolutionary Army). German industrial and military equipment (or the license to produce them in China) were purchased in large quantities, in return for Chinese raw materials. Chinese students and military officers studied in Germany (including an adopted son of Chiang Kai-Shek, who participated as a tank man with the German Army in the Anschluss). German military advisers, lead by Alexander von Falkenhausen, trained the best units of the NRA. This continued into the mid-1930s. Due to their non-aligned stance, the KMT continued to maintain close relations with the Soviet Union—notwithstanding its looming conflict with the Chinese communists (see below). Among others, Chiang Kai-shek's eldest son, Chiang Ching-kuo (and his eventual successor) studied in Russia and married an Ukrainian lady. After the Germans reduced cooperation with KMT as Sino-Japanese relations deteriorated in the latter half of 1930s, Soviet equipment and advisers replaced the German in NRA (to be supplanted by the Americans, in turn, by the early 1940s). 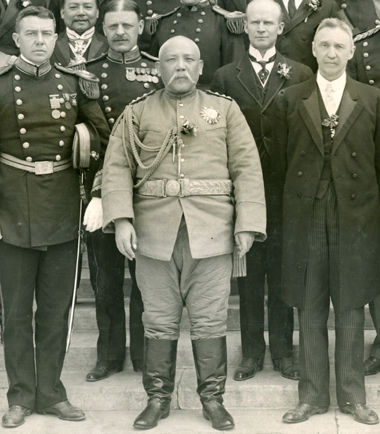 Russian general Vasily Chuikov served as the chief Russian advisor to Chiang Kai-shek until 1942, when he was assigned to defend some place called Stalingrad. On May 4th, 1919, a student movement protesting the Treaty of Versailles was held. German ports in China were given to the Japanese, instead of being returned to China. This decision was made without consultation, and so the Chinese were just a little upset. The protest then switched its focus to western imperialism. Out of this came the rise of (often secret, frequently suppressed) political parties in Warlord China. In 1921, a few dozen left-wing radicals and socialists formally founded a Chinese Communist Party (CCP) in Shanghai. Also attendant at the meeting was a nobody, a librarian from the Beijing University Library - 'Mao' something. At the Soviet Union's (covert) insistence, they joined the KMT and constituted a full third of the Kuomintang force that set off on the Northern Expedition of 1927 to unify the country. Chiang Kai-shek led this KMT expeditionary force, and from 1927 to 1928 they fought up the country. Warlords were either killed or (much more often) chose to 'ally' with them in exchange for keeping power. Such 'allies' could not be trusted, but Chiang didn't have the resources to fight everybody, which is what he'd end up doing if he said 'no thanks' the next time someone offered not to fight him. Things were bad enough with the split within the party. In April 1927, Chiang ordered a series of purges of socialists in the towns and cities under not-communist Guomindang control, starting with Shanghai. The city had largely been abandoned to its own devices after the local warlord had fled the area, and in his wake an uneasy coalition of gangster syndicates and Communist cells took control (the latter led by, among others, Zhou Enlai ). When the KMT arrived, Chiang sensed that the lower Yangzi might be a strong enough power base to allow him to terminate his alliance with the Communists early, before they gained sufficient influence within the party to betray him. It was a now-or-never decision as well, as the Communist-Guomindang forces had managed to secure Wuhan on the mid-Yangzi, which would offer them a significant support base of their own if they were given time to consolidate their hold on it. And so, Chiang sided with the gangsters - who exterminated the socialists (within the KMT) with great brutality. Anyone suspected to be a Communist (within the KMT) was shot on the spot. Some people merely wearing red clothing were also killed, as one of the emblems of the CCP were red clothes, particularly red scarves. If a person was found to have red paint on their neck or traces of it, they were shot by the KMT immediately. These massacres quickly spread to other cities, dissolving the alliance and forcing the CCP's standing army to make a stand against Chiang's forces. Outnumbered and with their morale crumbling, their forces were defeated in a series of hammer blows and Wuhan was captured, the CCP's armies melting away into the countryside. Chiang soon had to turn his attention to the drive northward, however, and the mid-Yangzi area was not cleared of communists before he was forced to move on. What was left of the CCP set up shop in the countryside around the mid-lower Yangzi and founded a series of communes, one of the biggest being in the mountains of Jiangxi Province. They attempted to make the peasantry their new support base, seeing as they had alienated the migrant-workers who made up the industrial proletariat and lost most of their urban contacts in the purges. Like the Kuomintang, they gained a measure of popularity among some peasants by policies of rent-reduction and land re-distribution, plus encouraging their soldiers to treat the peasants kindly (a huge contrast to KMT troops, who often beat up peasants). However, the CCP's policies of land collectivisation, conscription, and campaigns to suppress religion and 'feudal' culture resulted in riots and even outright rebellion against their rule in many areas. They also had serious trouble shaking off the appearance of standing for something - Russian Communism - that was wholly alien to China, courtesy of KMT propaganda. The KMT, on the other hand, set up an authoritarian government based out of Nanjing in the lower Yangzi delta (GMD-friendly and -'friendly' warlords remained in control of almost everything south, north, and west/upriver of the mid-Yangzi). Their new regime was marked by an unusually high degree of competence and efficiency (by the rather low standards of the Chinese governments of the time, and it was to be never seen again until the KMT established itself in Taiwan). As an administration, the Kuomintang was hampered at every turn by the need to sustain near-constant campaigning against rebels and rebellious 'allies'. This meant that the Kuomintang only had the budget to implement their own programs of rural reform (rent-reduction, limited land-redistribution from the corrupt and obscenely wealthy) in areas where the army was present, particularly during the Soviet-suppression campaigns. As far as the peasantry was concerned, the KMT was good news as it meant an end to the constant warfare of the warlord era and a drop in their tax-burden (the KMT only collected taxes from the towns and cities under its direct control, which is to say most of those in the provinces along the mid-to-lower Yangzi). Much of this need for constant campaigning was because Chiang and the KMT had become the most powerful force in the country, the natural inclinations of Chiang's warlord 'allies' being to unite against him to take him down - which they tried, several times, with little success. Chiang attempted to harness the power of 'blueshirts', paramilitary strongmen hired by the Guomindang in its capacity as a political party, to 'influence' public opinion in conjunction with a new secret police force under the secretive and sadistic head, Dai Li (a name that Avatar: The Last Airbender fans will recognise, as the Secret Police of Ba Sing Se are named after this guy). With the lower Yangzi cleared of warlords and the borders of Kuomintang territory secured, Chiang took the opportunity to consolidate his hold over the region by leading a series of campaigns to destroy the Soviets in the region. Several Soviets were destroyed in just this way, but the Jiangxi Soviet continued to hold out thanks to KMT supply problems, bad terrain, a rebellion in Fujian province, and yet another backstab-invasion of Kuomintang territory by Chiang's 'allies'. The 1930 'Central Plains' War' saw a grand alliance of warlords, made up of Feng Yuxiang of Anhui, Yan Xishan of Shanxi and Shaanxi, and the powerful New Guangxi Clique (including Li Zongren and Bai Chongxi, who would later be among the KMT's most able commanders) to take Chiang down once and for all. Neither Long Yun of Yunnan nor Zhang Xueliang of Manchuria rallied to Chiang's defence, and as the Kuomintang teetered on the edge of bankruptcy Time Magazine proclaimed that Yan Xishan would in all probability soon become the next president of China. However, the Kuomintang managed to pull through and defeat the numerically-superior forces of each of its enemies in turn, quickly moving to crush Feng's forces and annex his territories before throwing back the armies of Yan and the Guangxi Clique. When Zhang Xueliang moved troops up to his border with Yan, the latter sued for peace with Chiang. Though the war had been a desperate attempt to check his power, Chiang and the Kuomintang ultimately emerged from the conflict strong enough to quite literally take on all the Chinese regimes at once and win. However, seeing how the expense of the Central Plains War had pretty much broken the proverbial bank, direct annexation of the rest of China was ruled out. Meanwhile, the CCP had managed to replace its losses as its control of the Jiangxi countryside enabled them to conscript as many men as they needed, using guerilla tactics to harass the forces Chiang left behind whilst he was occupied with fighting elsewhere. However, on the Fourth Extermination Campaign (1933) Chiang, with help from Alexander von Falkenhausen and no other enemies to deal with, was finally able to pour some decent resources into an improvement upon the old strategy of encirclement and gradual advances. This improved strategy involved the use of several rings of blockhouses and field fortifications which ringed the Jiangxi Soviet and basically besieged them. This cut the Jiangxi Soviet off from outside supply and prevented them launching raids, forcing them to confiscate food from their civilian population and eventually to starve as continuing to do so looked like it would result in rebellion. One million peasant and 60,000 military dead later, with Chiang's forces inexorably closing in, the leaders of the Soviet decided to make a desperate move and stage a break-out. They left their wounded and too-weak-to-move soldiers behind and, throwing all their remaining forces behind a desperate attack at a weak point in the blockade, forced their way out and cut a swathe of devastation through the countryside as the force of 100,000 soldiers pillaged and looted their way through the mountains, taking what they needed at gunpoint. As unimportant and ignominious it seemed at the time, the "Long March" has since been called a pivotal moment in Chinese history. 100,000 soldiers broke out of the Jiangxi Soviet, but less than 20,000 soldiers (half of those 20,000 were survivors from the other mid-lower Yangzi Soviets) made it to the Soviet in Yan'an province. They fled a total of 9,000 kilometres, taking a long route through the Himalayan foothills to avoid Chiang, who used chasing them by his men and his air force as a pretext for a 'Communist Suppression Campaign' which allowed him to effectively seize control of the mid-upper Yangzi. Mao led the main band of Communist soldiers, which finally numbered around 8,000 people. Other groups took different routes, and many were caught and killed to a man, but most ultimately met up at Yan'an. Along the way they spread CCP propaganda at gunpoint, endearing themselves to the locals by carrying out vigilante executions of corrupt local officials and bad landlords. The Long March effectively gave the CCP a new leadership, as Mao and most of his lackeys and advisors partook in the March, which gave him and his followers a sort of moral authority which (together with ruthlessness and ambition) his competitors lacked. The Long March later acquired something of a mythical status as a result of post-war CCP propaganda, a result of which being that hundreds of people follow the route every year. The Civil War (temporarily) ended in December 1936 when the brilliant but embittered Manchurian warlord General Zhang Xueliang, son of the 'Old Marshal' warlord Zhang Zuolinnote Who had, funnily enough, been assassinated by the Japanese intelligence services in 1928. This was because Japan was worried that (despite having fought them for control of Beijing) he would be friendly to the Kuomintang in future and use his clout with the Soviet Union and the Guomindang to counter Japanese economic and political influence in Manchuria. The move arguably backfired as it inclined his son and successor Zhang Xueliang to do exactly that (Zhang's initial efforts to manipulate the Soviets and the Kuomintang were clumsy and led to a brief Sino-Soviet War in 1929, but were more successful after that). and commander of the final Communist Extermination Campaign to destroy the Yan'an Soviet, rebelled. It had been Zhang who had lost out when elements of Japan's Kwantung army had struck out and established an 'independent' Manchuria in 1931, leaving him only a scrap of his former power-base in the area around Beijing. The remnants of his territory had since been encroached upon as the Japanese Army gave its backing to and carved more 'client states' out of north-eastern China through the 1930s. Knowing that Chiang's campaign had a reasonable chance of success, he betrayed Chiang. Slaughtering Chiang's guards and holding him hostage, Zhang urged him - at gunpoint - to call off the campaign and form a United Front with the Communists (against Japan). It's been argued that Zhang's real hope was that the left-leaning Wang Jingwei would be able to step into the void left by Chiang - Wang was still a powerful figure in the KMT as Chiang had kept him close, as per the old sayin.note "Keep your friends close, and your (worst) enemies closer." Wang was widely regarded as a credible alternative to Chiang for the party's leadership, and unlike Chiang he would have had the support of moderates and socialists, something that would've defused or ensured a quick end to the Civil War. However, Chiang's wife and brother-in-law T.V. Soong checked Wang's attempts to take over and sabotage the negotiations (in the hopes of getting Chiang killed, making Wang de facto leader of the Kuomintang). Meanwhile, Chiang knew that Zhang was bluffing; if Zhang killed Chiang without Wang being firmly in control (and perhaps even if he was), China would disintegrate again. All the same Chiang agreed to Zhang's terms and, remarkably, kept his word - though he 'did' have Zhang imprisoned for life. The CCP was delighted. Has its own article. Also, it overlaps nicely with World War II. Interestingly, the CCP and the KMT continued to fight during the war. Nationalist China was officially one of the Allies, but the CCP was neglected by pretty much everybody, with America only launching diplomatic ventures to Yan'an in 1944. It's worth noting that the KMT's reputation as a corrupt, peasant-crushing administration was forged in the course of the war; with huge swathes of its territory occupied, the KMT had to turn to decentralising its administration (devolving power to the local and regional levels) as well as taxing and conscripting the peasantry to survive from about 1939 onwards (after two years of total war). The regime was tottering on the edge of total destruction at the end of 1941, but massive loans from the USA helped stave off the regime's immediate implosion for a time. The inevitable result of such a large cash infusion into the country was, however, inflation on a level that make the pre-existing inflation (courtesy of the KMT's desperate printing of money to avoid taxing its remaining territories into starvation and/or rebellion) several orders of magnitude worse. After WW2 was over, the CCP and the KMT turned on each other almost immediately. Chiang was torn between focusing on the anti-CCP campaign and overseeing a process of administrative reform and re-centralisation. Chiang's paranoia was his downfall in this regard, as he trusted too few people as a result of several decades' worth of coup and assassination attempts. Chiang's personal workload was too big for any one man to handle, and both the campaign and the reforms suffered as a result. Though he was the favourite of both Stalin and Roosevelt, and his forces managed to secure the CCP headquarters at Yan'an, his decision to send his best forces to secure Manchuria as the Soviet Union withdrew from the area was a grave mistake. The corruption had also frustrated Truman's government enough that the USA quickly withdrew both their Marines and all support for China, leaving the KMT without a major weapons source, while the CCP continued to receive small amounts of aid from the USSR. The result of such a massive deployment of loyal and competent troops away from what should have been the main focus of his campaign - clearing KMT territory of all large Soviets and Communist guerilla forces before moving to encircle and exterminate the Yan'an Soviet, advancing into Manchuria 'last' - was that the CCP was able to execute a fighting retreat from the Soviet and fade away into the countryside to conduct a guerilla warfare campaign against substandard forces belonging to Chiang's warlord buddies. Moreover, the decision 'not' to concentrate on eliminating the small Soviets first played havoc with the KMT's supply lines. Chiang had to divert significant forces to the area around Beijing and the Yellow river, where numerous Soviet communes had arisen during the War against Japan. The first year or so of the war (1946-47) saw the KMT's forces whittled down through an extensive campaign of guerilla warfare, the next two years seeing small and eventually large-scale conventional attacks by the CCP's forces. Much of the action took place in Manchuria initially, where the CCP managed to encircle and exterminate most of Chiang's best and most loyal forces. This led to one reversal after another, with the Communists eventually launching two major campaigns to make the Beijing/North-China area theirs by the beginning of 1949. By this time the numbers on both sides were roughly equal, but this betrayed a huge inequality that resulted from the CCP's relative efficiency as a military organisation (decent) and the KMT's (godawful on account of factional and inter-force rivalries that have to be read about in detail to be understood, let alone believed). The beaten Chiang Kai-shek retreated to the island of Taiwan - taking a few hundred thousand soldiers, a couple of million refugees, the central bank's gold and silver reserves, and much of the country's best government-owned artwork with him. With most of China (save USSR-influenced Xinjiang and semi-British Tibet, plus the island of Hainan which remained under KMT control for another year) under Communist control, the establishment of a People's Republic of China was proclaimed on October 1st, 1949. The latter parts of Towards The Republic deal, as the title of the series implies, with the troubled establishment of the Republic of China. The second half of Moment in Peking takes place between the 1911 revolution and the beginning of the war. Peking Opera Blues is about a whole slew of plots happening during Yuan Shikai's reign. More than half of Farewell My Concubine happens during this period, along with transitions to Second Sino-Japanese War and Communist take-over. The Sand Pebbles is about an American gunboat deployed in China at the height of the warlord period. Raise The Red Lantern by Zhang Yimou is set in the 1920s. The Painted Veil is about an American couple who go to China for humanitarian field work in the 1920s. Shanghai Triad also by Zhang Yimou is set in the 1930s. Pavilion of Women is a novel by Pearl Buck made into a movie in 2001, set in the period just before the beginning of the war. The Inn of the Sixth Happiness is about a British missionary in a remote corner of northern China in the 1930s. The Bitter Tea of General Yen by Frank Capra is about the love story between a warlord and a missionary. Tintin's adventure The Blue Lotus depicts the Japanese encroachment on China in the 1930s and the opium trade. A Pinwheel Without Wind (starring Zhou Xun) is set in the short lull between the end of the Second Sino-Japanese War and the resumption of the civil war in the late 1940s. So is the 1948 classic film Spring in a Small Town (小城之春) by Fei Mu, as well as its 2002 remake by Tian Zhuangzhuang. The Mummy: Tomb of the Dragon Emperor is set in China in 1946, after the end of the Second Sino-Japanese War and before the Communist takeover. Superpower Empire: China 1912 is an Alternate History work that looks at what might have happened if Yuan Shikai had died in 1912 instead of 1916. 1911, starring Jackie Chan as Huang Xing, Sun Yat-sen's Number Two. The opening scene of Indiana Jones and the Temple of Doom. Yangtse Incident: The Story of H.M.S. Amethyst (1957) is a British war film that tells the story of the British frigate HMS Amethyst caught up in the Chinese Civil War. Assassin's Creed: Templars has a story arc in 1927, where the Shanghai Rite of the Templar Order struggle to stop the warlords, Communists and the Kuomintang from attacking each other, plus keeping the Shanghai gangsters at bay. It reveals that Sun Yat-sen was Grand Master of the Chinese Templars, and his death was caused by Assassins. At one point, Darius Gift, a member of the British Rite, attempts to bribe Chiang into joining the Templars. Chiang accepts, but ultimately betrays the Templars by initiating the Shanghai massacre with Du Yuesheng's help, destroying the Templars' dreams of bringing order to and unifying China. Chiang's main reason is that he has no interest in working for anyone else anymore, and that he needs Templar money to continue ruling China, but only if the Templars in Shanghai accept his rule. They do, and Chiang spares them from the massacre. Always a Bigger Fish: Local warlord? Well, there are always the Nationalists. Inefficient KMT control? Wait for the Imperial Japanese Army. And let's not forget about the Americans supporting the KMT to keep the bulk of the IJA tied down in China (which they did admirably, despite being poorly supplied and relatively outgunned by the Japanese). KMT now ruling over most of China? It seems that the Soviets have just dumped half of their captured Japanese equipment onto the newly-formed PLA, who will proceed to win the next civil war using those. Armies Are Evil: Warlord armies were, as a rule, brutal and corrupt. Many often attacked villages for loot or just to get food. Arms Dealer: It could be said that every major country sold arms to the warlords. Everything from Japanese rifles, French tanks, Italian aircraft, German handguns and Czech machine guns were a part of at least one warlord's arsenal. Army of Thieves and Whores: Most of warlord armies, especially in early 20s, could be best described as really large gangs or bandit groups. Some weren't even wearing uniforms of any kind. The fact most of "conscripts" joined ranks with a gun barrel to their head and there was general lack of any training or discipline only made it worse. KMT wasn't much better in this regard, as all the way until the "80 Division Plan" begin slow implementation, roughtly sixth of all new conscripts were dying during training... out of starvation. And the training itself often lasted less than a week. Attack! Attack! Attack! : One of the biggest problems of the KMT's National Revolutionary Army . Jiang Jieshi was adamant on constant offensives. While this worked against barely cohesive warlord armies, it was suicide to pull against Japanese, who had clear technological superiority, greater discipline and were far better-supplied. Those killed in the opening months were most of the KMT's best, German-trained divisions, wasted on unwinnable battles. It took another few months of constant defeats for Jiang to finally wise up a bit. But at that point, the NRA was a pale shadow of its former self, worsening an already dire situation from the first day of the war. However, it should be noted the fierce, almost fanatical defense forced the IJA to commit much more troops that they wanted or could supply in China. This helped the KMT to bargain for Allied support once WW2 started and the Chinese interests of the UK and the USA were in danger. Badass on Paper: After going through battle of Shanghai and then battle of Nankin, 87th and 88th Division of NRA, two of the eight "reorganised divisions" trained under Germans, were both reduced to less than one thousand men in total. Four months earlier, they've had 14 thousand soldiers each, and only in Shanghai, 87th managed to lose over 16 thousand soldiers. The divisions never recovered from those losses fully, not to mention having inadequate equipment and being generally poorly trained after receiving reinforcements. However, they've kept their "elite" aura as two best divisions in entire army until at least 1942 and only stopped being treated as such once New 1st Army was created in India using American equipment. Balkanize Me: During the Warlord Era, the collapse of the central government resulted in the warlords setting up their own petty states, usually based on geographical bounds. Call to Agriculture: For both propaganda purpose and out of genuine desire do help, Communist soldiers were participating as free hands during harvests, all while warlord armies were busy stealing grain and extorting villagers. This greatly boosted support for Communists. Zhang Zongchang , the warlord that ruled Shandong, nicknamed '72-cannon-Chang', the 'Dogmeat General' and 'China's basest warlord' by Time. During his rule in Shandong, he finally learned to write and then proceed to produce gems like "let the cannon bombard Your Mom" in his collection of abnormal poems. He also solved local drought by slapping the statue of the local rain god in front of everyone, and when the drought continued, Zhang ordered his men to pull cannons onto a hill and shell the sky to summon rain, which worked. He had the nickname of the "Three Don't Knows," because he allegedly didn't know how many concubines he had, how much money, and how many soldiers he commanded. He is also one of the more successful warlords at the time, using armored trains and experienced White Russian mercenaries as his forces. Wu Peifu , 'the Philosopher General'. Known for regularly outflanking his enemies in battle and such an ardent nationalist that he refused to enter any foreign concessions on the principle of not working with foreigners, even when his clique fell to the Kuomintang army. Yan Xishan , who became known as 'Model Governor'. When he took over Shanxi during the republican revolution in 1911, it was the poorest province in China and he sincerely started an extensive series of reforms and programs - many of which were successful to a certain degree - aimed to improve "his" province. In the same time he played extensive political and diplomatic game, balancing every faction in the Chinese landscape. He even managed to get a Time cover during the Central Plains War, when for a while it seemed he might be able to create a new, stable government for all of China, unifying warlords under single banner. As far as warlord standards go, he did his very best to be a benovelent autocrat, rather than greedy looter. Dark Horse Victory: KMT and the Communists had it going for themselves. Nobody had any faith KMT will achieve anything with the Northern Expedition and the fact it won Central Plains War while attacked by all the disobeying warlords came as an even bigger surprise. Meanwhile, Communists went from Ragtag Bunch of Misfits to one of the most organised forces in Chinese landscape, securing genuine popular support (which KMT and warlords never managed to achieve). Eventually they became the final victor of the power struggle, taking over all of mainland China, despite starting out as the weakest faction. The 1st American Volunteer Group, also known as Flying Tigers , under general Claire Chennault, is among the most famous examples in history. It turned out to be a highly efficient unit despite miniscule size. Ironically, while formed as a direct support for the Kuomintang, it gained massive propaganda value for the Americans, as it became operational just a few days after Pearl Harbour, directly engaging and winning against the Japanese air force while American forces were losing ground all over the Pacific. Eventually the unit was reformed into an "official" US Army Air Force unit. Today, the Tigers are mostly well-known for the iconic shark-teeth nose paint on their P-40 Warhawk fighters. Earlier in the war, out of all people, the Soviets sent pilots, planes and personnel to help the Guomindang fighting the Japanese, lending in total over 800 planes and 250 pilots for them under Operation Zet, a secret delivery of equipment and advisers to the KMT. While ideologies clashed and the Soviet Union officially withdrew all support from the Nationalists all the way back in 1927 (due to the collapse of the shaky Nationalist-Communist alliance), the Empire of Japan and its ambitions were deemed much more dangerous than the Kuomintang could ever be. Even after withdrawal of Soviet pilots, most of their planes were left behind and created the backbone of the Chinese air forces until American planes arrived in greater numbers. Easy Logistics: Not so much averted, but nuked from the orbit. Due to great distances, non-existing infrastructure and having a single line of railway in all of China, the entire period saw a massive struggle to move just about any amount of resources or troops over even short distances. Then Japanese forces took over most of the communication lines and further escalated after they took over all ports and Burma, virtually cutting the KMT from outside support. On the other hand, this lack of infrastructure eventually bogged down the IJA to a halt. Embarrassing Nickname: As part of his slander toward Chiang Kai-Shek, General Joseph Stilwell coined "Peanut Head" and the famous "General Cash-My-Check" nicknames. Ironically, the actual costs of land lease for KMT were peanuts when compared with all other war efforts, but due to Stilwell's reports it still looked like a waste. What those reports kept ommiting was the fact KMT tied down a third of the entire Imperial Japanese Army in China, distracting them from further defending their islands. Enemy Mine: The 'cooperation' between the Communists and the Nationalists was primarily over the threat of the Japanese. Consisted primarily of not shooting each other for the most part. Exact Words: "The Chinese Communist Party does not endorse the use of opium within its territory." This did not stop them growing it and selling it to people outside their soviets. At one point Zhang Zongchang claimed that he would either gain victory or return home in a coffin, he lost and was pushed back and true to his word he returned home in a coffin, though very much alive and he went on fighting for years after that. Fascist, but Inefficient: Nationalist government was a combination of Byzantine schemes at the very top, lack of any control in the bottom and proverbial corruption in the middle, all run by moderately well-armed bullies who had hard time organising their armies beyond gang structure. The comparison between what was theoretically under KMT control vs. what they really controlled and could use as their own powerbase is laughable. Implementation of staunch nationalism was more problematic than helpful, considering all the different minorities living in China (not to mention one of the most powerful cliques in Chinese landscape was made out of Hui Muslims). And if extreme corruption itself wasn't problematic enough, there was also rather... peculiar stance toward tax collection and money printing. KMT-led government managed to debt itself into bankrupcy twice before the outbreak of the war with Japan and then fuelled hyperinflation with careless mismanagement, while stealing left and right public funds and taxes for private use. The party initially had less than few dozens of members and that situation kept going for few initial years. With zero public support, badly organised, fully dependent on Soviet advisors and monetary support, and worst of them all, completely detatched ideologically from Chinese reality, the party was barely functional. Cue few years later being the main and almost obsessive target of Jiang Jieshi's expeditions and then anything after the Long March is pretty much a legend. Currently the Party is still rulling continental China and it will stay around for at least a while longer. Due to mentioned above early situation of the party, Mao was quite openly considering leaving it for good, as he didn't even show on the annual meeting. Then he was constantly side-tracked by each new leadership. By the time of the Long March, he was third-ranking member with barely any power. By the end of the March, he was the de facto leader of the party and nothing was going to change that. Few years later he became leader of entire China and not counting few periods of consolidation, he stayed in this position until death, while his cult as the father of the nation still lives. Good Guns, Bad Guns: The Mauser C96 was used a lot in the different wars during this era. It used to be a "bad guy gun" due to frequent use by warlords, but stopped after the Chinese started using it in wide quantities, most notably during the Second Sino-Japanese War and in World War II as the main sidearm of many soldiers. The Hanyang 88 rifle was first used during the 1911 Revolution to overthrow the Qing Dynasty, and was given to provincial troops by the Nationalists during the Second Sino-Japanese War. Similarly, the Type 24 rifle, a copy of the Mauser M1924 (itself the prototype for the Karabiner 98k) became the standard service rifle of the Nationalist Army in World War 2, and was later used by both sides in the Chinese Civil War. This gets an amusing inversion in case of Communist Chinese films of the 1950s-70s set during the Civil War. The heroes tend to be either Communists or at least neutral parties with good combat skills, occasionally becoming a Badass Army in propaganda films. The bad guys tend to be Nationalists, occasionally using surplus German helmets, gear and weapons, playing the local equivalent of Those Wacky Nazis and behaving like aggressive thugs, as well as being depicted as a Redshirt Army of 'reactionaries' despite their superior equipment. Godzilla Threshold: When it became apparent there is just no way to stop or even slow down Japanese advance toward Wuhan, then-emergency capital, Jiang ordered his troops to dig through Yellow River's dykes, creating the biggest articial flood in history. While the flood destoyed farmland in three provinces, killed in total well over 3 million poeple (most by a disastrous famine, caused by destruction of farmland) and shifted Huang He estuary south by 400 km, IJA still managed to take over Wuhan and was barely halted. The flood also was a great boost to Communist popularity, as all they had to do was point finger at KMT and say "look what they did to you". Hit-and-Run Tactics: Preferred tactics of Communists ever since the Long March. And one of the main reasons why they've won in the end. Mao was a keen reader of The Art of War, following certain tactics from it to the T.
Hoist by His Own Petard: General Stilwell decided to use the Operation Ichi-Go for his own advantage. With clear evidence of incompetence of Chinese forces outside his command, he masterminded a scheme that would put him in charge of all Chinese troops, then order them as seem fit and get all the glory for defeating Japanese he ever wanted. After eventually getting a positive reply from president Roosvelt, he smugly delivered the demands to Jiang the moment he read the letter, rather than let things settle down for few days and more diplomatic means being applied. Upon reading Roosvelt's message, Jiang consider the demands from it to be de facto subjugation of Republic of China and greatest humiliation imaginable. Instead, his reply asked for any given "capable general" to replace Stilwell, in return promising greater co-operation with Americans. Being sick of constant infights and issues created by Stilwell, Washington recalled him and send general Wedemeyer as a replacement. Hyper-Competent Sidekick: Zhang Zuolin was atrociously bad at governing Manchuria when it came to civilian stuff, but he had Wang Yongjiang on his side. Being barely a head of local tax office prior his appointment as the President of the Bureau of Finance, Wang turned out to be a more than "just" a brilliant accountant, but also a competent economist and a planner. With his guidance, Fengtian clique managed to not only solve its fiscal issues, but stabilise its currency and make it gain value, all while rest of China was printing worthless banknotes. Then extensive program of rural settlement, land reclaimation, industry development and railway construction begun, all turning profit, too. However, progessively more erratic military spending and local wars going poorly made Wang more and more disillusioned, as all his hard work was often literally going up in the smoke. After nine years of hard work and loyal service he resigned in protest, cutting all ties with Fengtian government. Wang also had a slide of Recruiting the Criminal - since he was previously working in a tax office, he knew all the tricks used to abused the system inside-out. By third fiscal year of him leading the Bureau of Finance, the system not only worked properly, but started to generate surplus. Inherent in the System: The complete collapse of the central government once Yuan Shikai died, along with emerging warlord states and their shaky alliances can be traced all the way back to times when Qing dynasty started slow and fragmented modernisation. While army was the main focus of the reforms since at least 1870s, administration was left almost intact in the model mastered by Tang dynasty in 8th century all the way till 1901 and even after that, the implementation of modern administration varied from place to place, never truly covering all of China, not to mention creating integral bureacratic body. And while the army was using modern(ish) structure and equipment, it was still organised regionally and with felthy to its commander, rather than state. Thus without either republican governmentnote Yuan disbanded it, re-establishing empire for final months of his life or Yuan's authority (he was a very charismatic man), all the different military commanders simply took what was "their". The endemic, structural corruption within both civilian government and military was also part of the "inheritance" from the imperial administration, where officials were not paid any wage and their only source of wealth was what they've managed to secure as bribes and simply steal. It was a literal tradition to do so, so not only nobody saw anything wrong with it (aside maybe the top of the system), but there was little will on lower levels to fight it. Printing money and collecting taxes ahead of time were desperate moves KMT started to implement as more and more ground was taken over by Japanese. Eventually, its territories were completely cut out from outside world, making the situation even more dire. Hyperinflation caused by never slowing printing, combined with robbing people blind, absurd conscription demands and increasingly more and more punishing requisitions of food for army provisions quickly burned through all the goodwill that was still left toward the government. While those steps were the only way for KMT to survive at all, it turned it into the enemy of the people it was officially "protecting" and made Communist field work all that easier. Just three words: Chinese Expeditionary Force. The idea was simple - send troops to Burma, help secure flow of supplies over the Burma Road and fight against Japanese. In reality, this greatly over-extended capabilies of the Nationalists, pitted Stilwell against wide array of Allied commanders (who considered him an incompetent buffoon) and lead to further erosion of manpower Kuomintang was slowly running out of. Oh, and the first expedition utterly failed, leading to closure of the Burma Road for next 3 years and requiring organisation of second one. Then it escalated further into Too Dumb to Live territory, when eventually the New 1st Army and the New 6th Army, trained, equipped and accustomed into fighting in tropical jungle, ended up deployed in Manchuria in 1945. Surely, the best use of the high-quality troops requiring massive material support is to chase ghosts in a snowy steppe. Both armies were wiped out by attrition tactics employed by the Communists, marking the downfall of KMT in the civil war. Jerkass Has a Point: While General Joseph Stilwell was an aggressive jerk of such grand proportions he was making Patton look like a nice and polite individual, he was also absolutely right when calling KMT's leadership bunch of thieves too busy filling their pockets to fight the war. All the land-lease delivered to China was divided roughtly into six parts: one sold directly on the black market, two sold by high-ranking officials, one stockpiled under Jiang's orders for the continuation of war against the communists and one really lost during transportation. Only the final, 6th part of all war material was delivered to troops in the field or in training. Stilwell also quickly realised the only force in China that has both any sort of organisation and popular support are Communists. He even actively lobbied for American warm-up toward Mao's government, something that Mao himself was very interested in, but Washington had none of it, especially after Truman became president and war was slowly wrapping up. Join or Die: Knowing how bad the morale of KMT forces were during the civil war, PLA commanders were often giving this choice to encircled KMT units. Unsuprisingly, most of GMD troops, especially those coming from former warlord armies, preferred to change side than get killed. Klingon Promotion: A common way for warlords to succeed their superior. Legacy Character: Countless divisions in NRA had either "New" or "Reorganised" (or both) prefixes in their names, invoking either their origins or legacy of units wiped out in combat. Let's You and Him Fight: The most efficient strategy used by Mao during the initial stages of Second Sino-Japanese War was watching from afar and observing how the Japanese and Nationalists/warlords bled each other out, occasionally performing isolated guerrilla battles against the IJA. Nature Lover: With all his countless failings and infamous brutality, Ma Bufang, warlord of Qinghai, was also a nature conservationist, way ahead of his times. For very practical reasons (encroaching Gobi desert), he implemented an extensive re-forestation program, along with building irrigation system to sustain it and regular inspections to see the effects. Peasants were not only having a quota of trees to plant (saplings were provided by the government) and maintain, but unauthorised cutting of a tree was punishable by death and strictly enforced. Environmentalism became part of local education system, while special teams were travelling the countryside and teaching locals the techniques and importance of tree planting and soil preservation. For the time being, Gobi's advancement was considerably slowed down, if not outright stopped. All for Nothing: During the Great Leap Forward campaign, all of that effort was wasted, with Qinghai ecosystem destroyed due to almost complete deforestation and abysmal, outright stupid farming practices. In particulary ironic twist of fate, the trees planted under "reactionary" Ma clique were used to fuel the iconic, "progressive" backyard furnaces, producing nothing but slag and ashes. No Points for Neutrality: Famously averted by Yan Xishan, warlord of Shanxi province. He stayed there in power from the Xinhai Revolution of 1911 till... 1949, almost always keeping outside of the on-going conflicts and balancing between all factions emerging during those 38 years. He was so good at staying neutral he managed to play Kuomintang, Communists, other warlords and even Japanese, always staying on top of everyone, and without any side declaring him as a traitor. However, it did eventually backfired against him in the final months of the Civil War, when attempts to unite Jiang Jieshi and Li Zongren alienated Yan from both of them. Normal Fish in a Tiny Pond: The German-trained divisions of National Revolutionary Army. They were absolutely normal, contemporary infantry divisions with somewhat underpowered artillery support and their equipment was bog-standard mid-30s weaponry. But for Chinese standards those eight divisions were Elite Army, worth more than the rest of NRA put together. Outside-Context Problem: The KMT's "alliance" with the German government, especially after the Nazis took over. Both sides did it for purely practical and trade-related reasons: German industry needed cheap resources China could provide, while the KMT needed decent weapons and military instructors. The Germans introduced good tactics, gave China blueprints for German equipment, helped bring in some artillery and, which was most important for Chinese, provided machines and know-how for heavy industry. The deal quickly became problematic after Japan declared war on China and was officially cancelled in 1938. Even if so, Communists used this fact extensively in their propaganda. Plunder: After capturing Manchuria from Japanese, Red Army troops were busy dismantling in a systematic way everything that wasn't nailed to the ground and shipping it directly to war-torn Soviet Union. And when they were done with that, they've also dismantled sizable part of the railway lines Japanese build there since the proclaimation of Manchukuo. President for Life: Yuan Shikai initial ambition. It quickly turned into styling himself as the new emperor. Proxy War: Minor case when compared with incoming Korean War, but the reignited civil war saw massive Soviet support for the Communists, while the Nationalists were initially backed by the United States. In fact, the strong US involvement in Korea was in part caused by the failure to keep communism at bay in China, something they tried to atone for by supporting Chiang in Taiwan after the war. The Purge: Jiang Jieshi did it to the Communists (within the KMT) when he figured they were becoming dangerous. In 1927, he cooperated with local gangsters to massacre as much Communists as possible in Shanghai, leading to many fleeing into the countryside where they were tracked down and shot. He was right, actually; they were always planning to betray him, he just betrayed them first. Also, the Nationalists and Communists to themselves. Mao was not top dog by a long shot when he was carried by sedan chair on the Long March, for instance. The Quisling: Wang Jingwei, once one of the most prominent people in the KMT, started a collaborationist government with Japanese soon after the war broke out. To this day, his name is synonymous with traitor in Chinese. Reassigned to Antarctica: Being send to China was considered as a dead-end for military career in US Army. General Joseph Stilwell took it really, really bad when instead of commanding North African campaign, he was personally selected by Roosevelt to keep China fighting with Japan. It ended up with open and irrational disdain for Jiang Jieshi and Claire Lee Chennault (commander of the Flying Tigers and the USAAF in China), seriously hampering support for the KMT with slanderous reports sent back to the US. Screw This, I'm Outta Here! : The KMT could probably fight for another decade, if not even get another cease-fire, but then the Liaoshen Campaign happened. The entire North collapsed, taken over by Communists, in the process wiping out the GMD's American-trained New 1st Army. It hit morale so bad, the biggest enemy of KMT became widespread desertion. Entire brigades were either outright disappearing or, which was far worse, switching sides and joining the PLA, thus providing Communists with well-trained soldiers, capable of using tanks and heavy ordnance. Slobs vs. Snobs: Part of the Communist appeal to the masses was how down to earth they were. Jiang Jieshi absolutely loved to parade in the most outlandish uniforms possible, to the point he looked like some sort of an alien to average Chinese in rural areas. Communists, with their drab clothes, simple manner and coming from the bottom of the society were much easier to digest and accept. A Storm Is Coming: The short period between Japanese surrender and the resumption of the civil war was relatively peaceful (at least when compared with the slaughter going for past 12 years), but everyone was aware it won't last for long. GMD used that time to desperately storage as much supplies and conscript as many people as they could, fully knowing they will have to abandon certain areas pretty soon. Meanwhile, Communists were forming entire divisions using Japanese hardware handed over by Soviets. Taught by Experience: After battle of Wuhan the frontlines became static and Japanese didn't perform any major offensive for next few years. What they did was throwing New Meat into small skirmishes against Chinese, thus providing them with live combat experience, as a form of training. The disparity of organisation, equipment and morale was big enough to consider it a viable training option without endangering new soldiers too much. The Uriah Gambit: Used by Jiang all the time to get rid of or weaken troublesome elements within the army and party. Doing too well for yourself? Here, defend this town against the Japanese with a few divisions armed with small arms and mortars, while the IJA back up their assault with planes, poison gas and artillery. Have fun! The Triads and the Tongs: Due to the breakdown of organized government and the general corruption of institutions, criminal organizations were quite powerful throughout the period. The most powerful man in Shanghai, for example, was a triad boss named Du Yuesheng. Underdogs Never Lose: Subverted. You'd expect Communist propaganda would embrace fully the early state of their own forces and have a run with this trope, given how they've scored a major Dark Horse Victory. You'd be wrong. For the most part of PRC existence, both propaganda and "official history" presented the Communists as dominant force that was always the top dog and thus was capable of uniting the nation. This has a lot to do with Chinese culture and simple historical precedence of establishing new dynasties - even if you scrapped your way from underdog position, admitting so is equal with admitting you usurped a higher power, which is a big no-no. Villain Protagonist: No matter what, no side in the conflict could be called "good". Both Nationalists and Communists commited absurd amount of atrocities, combined with wanton corruption and constant backstabbing in respective parties. Villain with Good Publicity: General Joseph Stilwell, the main aide send by president Roosevelt, turned out to be this when most of the red tape was eventually removed from the archives. While Stilwell himself was not a bad general, his desire for glory and increasing hatred of Chiang corrupted him. During his entire tenure he made sure to paint Chiang Kai-Shek in the worst possible light in his reports, while greatly boosting his own image as the Only Sane Man for the American public and top brass. In reality, during his time in China, Stilwell was petty and vindicative and by all accounts, was an extremely stubborn individual with a fierce fixation on "besting" Jiang, or the "peanut", and showing him his "right place". It reached levels of outright malice, as he intentionally didn't leave a single page of briefing for his replacement, General Wedemeyer, while getting rid of most of tactical and strategic data and never meeting the man in person. Although Wedemeyer did his best to improve the situation and even suggested shipping loads of surplus German ammunition and weapons to China, the damage was already done and the American government saw Chiang as a stubborn fool leading an astoundingly corrupt government that was constantly begging for handouts. The "alliance" of Guomindang, Communists and all remaining warlords is probably one of the most famous cases in real life. China itself during the Warlord Period can count too, since nominally it was still single, integral country. It was even worse within the Guomindang military command. Jiang Jieshi, Joseph Stilwell and Claire Chennault hated each other to the point where they were making tactical and strategical decisions entirely based on spiting their personal enemy. Jiang and Chennault resolved any issues pretty quick, with Chennault becoming a favored advisor to Jiang, but both had bitter and mutual hatred toward Stilwell, eventually getting him removed from command for his increasing attempts to piss off Chiang by withholding huge amounts of vital lend-lease supplies from many NRA divisions. We Have Reserves: Reached astonishing levels when the civil war restarted. After proclaiming their land reform, Communist gained massive surge of manpower, further helped by over a decade of field work among peasants. They were thus perfectly capable of throwing million after million of people at KMT positions, lose them all... and still bring new divisions, while Nationalists were slowly, but steadily losing precious, well-trained veterans, with no means to replenish their ranks. You Are in Command Now: Mao eventual ascent as the leader of the Communists was achieved mostly due to the fact everyone else outranking him in the old Party structures or having bigger authority was killed or died during the Long March. The remaining big-wigs were quickly convinced by troops loyal to Mao to follow the new boss. You Have Outlived Your Usefulness: When Zhang Zuolin's army failed to stop the Nationalists during the Northern Expedition, the Japanese decided to get rid of him by blowing up his train while he was returning to Manchuria. Younger Than They Look: Despite appearing on almost all photos as senile old men, Yuan Shikai was barely 53 when he took over and 57 when he died. This is especially jarring when compared with Jiang Jieshi, who was roughtly the same age during Second Sino-Japanese War.